34th Sunday newspaper story; 8 Feb - 24 May 1953. Previous Frew appearances: #126 (1958), #215 (1962), #339 (1967), #498 (1973), #676 (1979), #893 (#1987). 82nd daily newspaper story; 21 Aug 1961 - 10 Feb 1962. Previous Frew appearances: #212/3 (1962), #333/4 (1967), #484/9 (1972), #662/3 (1979), #871/2 (1987). 91st daily newspaper story; 19 Apr - 31 Jul 1965. Previous Frew appearances: #321 (1966), #476 (1972), #651 (1978), #860 (1986). 95th daily newspaper story; 12 Sep - 24 Dec 1966. Previous Frew appearances: #341 (1967), #494 (1973), #672 (1979), #888 (1987). 112nd daily newspaper story; 15 Feb - 8 May 1971. 115th daily newspaper story; 8 Nov 1971 - 8 Jan 1972. Previous Frew appearances: #475 (1972), #655 (1979), #864 (1986). 140th daily newspaper story; 18 Dec 1978 - 19 May 1979. Previous Frew appearances: #822 (1985), #848A (1986). First published in Fantomen by Semic, Scandinavia in Nr.2/1984. This story is reprinted from Frew #850 in 1986. First published in Fantomen by Semic, Scandinavia in Nr.25/1983. This story is reprinted from Frew #853A in 1986. 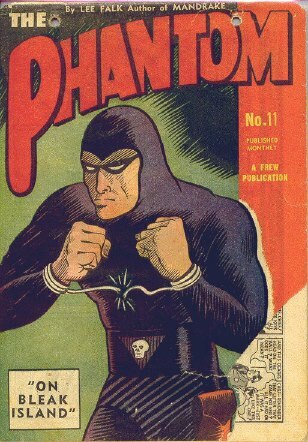 It seems hard to believe, but the year 2002 represents the 12th successive year Frew has produced an Annual Special devoted to the adventures of The Phantom. It all began in 1991 when we published the 1000th edition (No 972) of The Phantom comic book and put together our biggest ever issue to celebrate the occasion. Such was the response to that 1991 edition that we decided to keep producing an Annual Special. 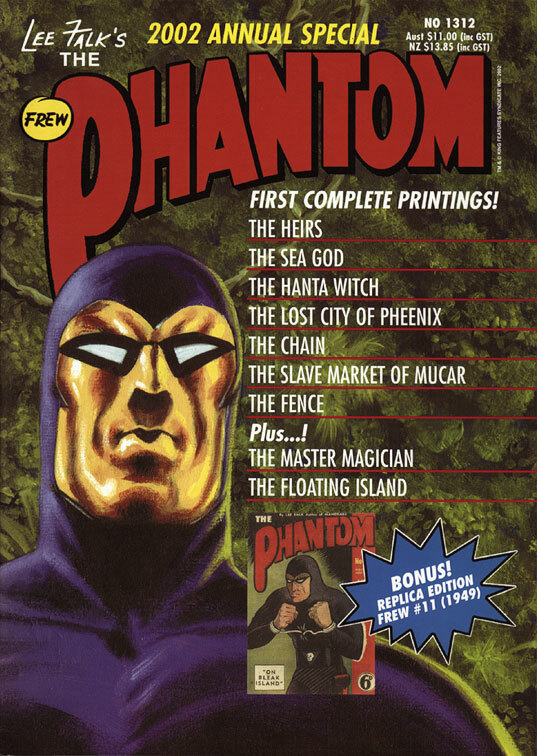 The Frew Annual is now unchallenged as the biggest Phantom comic book in the world and the only Special issue which has, with the exception of the 1993 issue, included a bonus replica of the original Frew Phantom comic books which first appeared in September 1948. This 2002 Special contains another widely assorted collection of Phantom adventures, with the accent this time around on classic Sy Barry-illustrated stories. For a little variation, there is also one story created by Wilson McCoy and two from master artist Hans Lindahl written respectively by Dai Darell and Norman Worker. Plus, of course, yet another Replica issue, this time Frew No. 11 from 1949, which is the second and final part of the Lee Falk-Ray Moore classic, The Seahorse . The really exciting thing about this year's Special is that we have been able to piece together every story in its original entirety! I hope everybody enjoys the offering! Inside you will find all the important publishing data covering 2001 including the complete chronology of our 31 editions for the year and information about the most published writers and artists, the best-selling editions and the covers ranked in popularity order, based on comments in correspondence from fans. Because the feature has always been so well received, we have included some more Did You Know? sections in which you will find fascinating historical trivia culled from 66 years of Phantom stories in and after Lee Falk's lifetime. Much of this information has been researched by our long-time historian Barry Stubbersfield of Brisbane, Queensland. Barry has been an enormous help to all at Frew for many years and without his input and encouragement it would have been extremely difficult to provide enthusiasts with the background information they obviously crave. Special thanks are also extended to our American friends Ed Rhoades, Pete Klaus and Bob Griffin of Friends of the Phantom and to the King Features archivist, Mark Johnson. All have been a tower of strength for many years and I sincerely hope we can count on their input for many more years to come. Thanks are also extended to all those people who not only buy every edition, but keep in touch by sending all manner of news tips and historical data. I only wish we had the space to devote to the photographs of Phantom artwork which seems to adorn so many country towns and motor vehicles, and of strange shapes to be found in the Australian bush which are, for all the world, chillingly reminiscent of not only the Skull Cave, but Phantom Head Peak and even the Whispering Grove!